The pathologist Jack Kevorkian became the central figure in the physician-assisted death controversy in the United States, a controversy that has had ripple effects throughout the world. Born in 1928, Kevorkian was the son of refugees who escaped the Turkish massacre of Armenians in 1915. Many of the members of his mother's family and all of the members of his father's family were among the victims. The Kevorkians settled in Pontiac, Michigan, where his father worked in an automobile factory and his mother looked after Jack and his sisters Margo and Flora, who would assist him throughout the activism career he launched in his later adult years. "Intelligent," "resourceful," and "independent" are adjectives often applied to the young Kevorkian by those who knew him. He went his own way and questioned authority long before it became commonplace to do so. An honor student in high school, Kevorkian obtained his medical degree from the University of Michigan in 1952. The specialty with the most appeal to him was pathology, the study of diseases and their effects. He soon devoted himself to studying the physical changes wrought by death. As early as his residency at Detroit Receiving Hospital in 1956, colleagues gave him the nickname "Doctor Death." Kevorkian was especially curious about the status of the eye at death, and arranged to be notified when a patient was on the verge of death. After death, the cornea becomes hazy and the retina segmented and pale as blood circulation ceases. Kevorkian recommended that his fellow physicians examine the eyes whenever there is a need to look for signs of life. His findings were published in medical science literature. Dying and death were neglected topics of research and education in medicine when the young physician was conducting his studies. He was therefore almost as much an outsider as an insider. 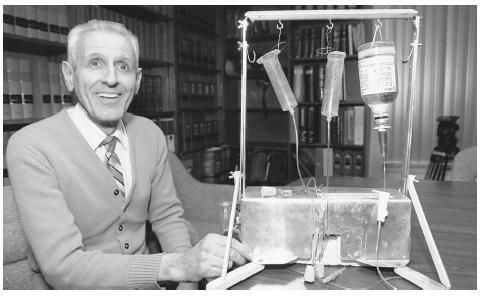 Jack Kevorkian sits with his "suicide machine," a device consisting of tubes, hypodermic needles, saline solution, a muscle relaxant, and a lethal drug . Difficulties in working against the mainstream were also being experienced by other pioneers in their various clinical and academic environments. Kevorkian showed little or no interest in these parallel developments. Years later he still held himself apart from the hospice/palliative care movement, death education and counseling, peer support groups, and the rapidly expanding base of research knowledge. Kevorkian therefore made himself vulnerable to criticism that he had failed to inform himself of significant developments in pain control, social support, and other areas in the field of death and dying. Meanwhile, he considered marriage but broke off his engagement because he judged that his fiancée did not possess "sufficient self-discipline" (Betzold 1996, p.38). Many years later he expressed regrets for missing out on the satisfactions of family life, but the absence of these obligations and distractions offered more opportunity for his other pursuits. In addition to his primary agenda, Kevorkian learned to play several musical instruments, and created some intense, death-haunted oil paintings. Kevorkian had an activist agenda in mind long before he became a public figure. He proposed that the bodies of executed criminals be used for scientific experiments. The convicts would be anesthetized in order to keep their bodies somewhat alive and therefore available for experiments that could not be conducted on people who were entirely alive. He also transfused blood to living patients from the corpses of people who had experienced a sudden death. Both the death-row proposal and the cadaver donor procedure were ill-received by the medical establishment. Kevorkian's views made him increasingly unpopular and therefore limited his employment opportunities. As his mainstream medical career faded, however, Kevorkian had more time available to advance his mission. Kevorkian set forth his agenda in his book Prescription: Medicide (1991). He took the position that the Hippocratic oath is not and never has been binding on physicians. Kevorkian contended that a new medical specialty, "obitiariry," should be established to offer "moribund people" a dignified and easy death and to provide the opportunity for experimental research on their remains. This specialty would be practiced at centers for medically assisted suicide and research, which were to be known as "obituaria." Kevorkian thought that medically assisted suicide—or what he termed "medicide"—should be made available to all people who wish to end their suffering, whether or not they are terminally ill. The first step in applying his program was his construction of a "suicide machine" that he called first the Thanatron, then the Mercitron. The physician prepares the machine, but it is the patient who presses a button to release a deadly drug. A middle-aged woman by the name of Janet Adkins was the first person to make use of Kevorkian's invention on June 4, 1990. Kevorkian was charged with murder but was then released when the court ruled that Michigan had no law against assisted suicide. His license to practice medicine in Michigan was suspended, however, and later authorities in California did likewise. During the 1990s Kevorkian was "present" at the deaths of at least 120 people. His participation in these deaths was labeled as "murder" or "homicide" by Michigan authorities who, nevertheless, failed in repeated attempts to convict him. He was charged repeatedly with assisted suicide as well as murder, each time defying and defeating the courts with the help of a high-profile attorney. Kevorkian argued that he had not and would not kill anybody—the patients had made the last move on their own volition. It was Kevorkian who put himself into a position in which a guilty verdict was almost inescapable. He invited CBS's 60 Minutes program to show a videotape he had made of his participation in the death of Thomas Youk. The result was conviction for second-degree murder and delivery of a controlled substance. He received a sentence of ten to twenty-five years in prison, which he began serving in 1999. Despite Kevorkian's conviction and jailing, the assisted suicide controversy stimulated by his beliefs and actions continues to influence health care, legislation, and the field of bioethics. Betzold, Michael. Appointment with Doctor Death. Troy, MI: Momentum Books, 1996. Kaplan, Kalman J., ed. Right to Die versus Sacredness of Life. Amityville, NY: Baywood, 2000. Kastenbaum, Robert. "Looking Death in the Eye: Another Challenge from Doctor Kevorkian." In Kalman J. Kaplan ed., Right to Die versus Sacredness of Life. Amityville, NY: Baywood, 2000. Kevorkian, Jack. Prescription: Medicide. Buffalo, NY: Prometheus, 1991. Dr. Kevorkian is set to be parolled in June some time, after only seven years in jail.